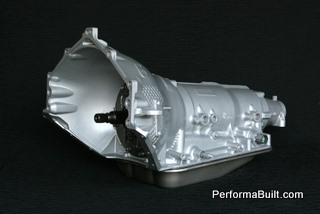 You are looking at the PerformaBuilt Heavy Hauler Series transmission. These units are built very similarly to our Pro Race units, but the focus is on durability while maintaining reasonable shift quality. These were specifically developed for commercial, heavy towing, and 4×4 vehicles. The shifts on these units are designed to take the abuse and work associated with these vehicles, but without the tire chirping shifts of our race and performance units. For the 3-4 clutch, we use 8 heavy duty friction and steel plates. More friction plates than stock; which is 6 in most cars and trucks. 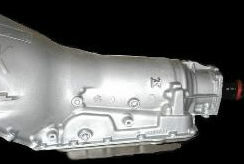 Some additional modifications to the 3-4 set and this clutch pack prevent scoring and burning and increase hold. Moving on, in the planetary, both sun gears are modified to increase lube flow. This is a must in these heavy duty units. A lack of lube and cooling is a killer when pulling the boat, camper, or work trailer loaded down with equipment. The Heavy Hauler Series uses 4 pinion planetaries. For the Heavy Hauler Transmissions, we only use the thicker “K” cases that came in the very high performance cars and 4×4 trucks. You won’t have to worry about cracked bell housings and cases. Lastly, we address the valve body. Here we perform all the updates for lube and durability, and eliminate the partial lockup function in the 4L60E. This greatly extends the converter life and helps to keep everything much cooler. We improve the flow to the 3-4 clutch set, making sure it has enough supply to hold the load on this crucial shift. We enlarge the apply release feeds for the lockup clutch to make it apply positively and avoid converter clutch burn-up under heavy load. 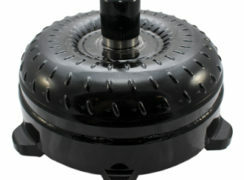 Finally, we include a low stall heavy duty carbon composite lockup clutch torque converter. Please note our Warranty page. This unit comes with a 2 year warranty. This unit comes with a converter up to a 2500 stall at no additional cost. 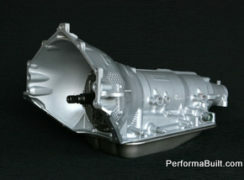 This transmission will support up to 500 RWHP.